I received the mentioned items for an host review. This post contains affiliate links which with a purchase can send money my way and help keep this blog running. As always, all thoughts and opinions are 100% my own. Gender reveals are really cute. I just recently went to the cutest gender reveal of a good friend of mine. They had a box with balloons that they opened up with blue balloons to signify it’s a boy! So this got me thinking… what about a useful gender reveal gift. 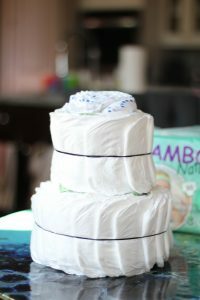 Opening a diaper cake with a swaddle inside that is either pink or blue? Don’t feel like it can only be made for gender reveals. If the mommy and daddy already know the gender cover it in ribbon and decor that is all one gender and give this as a shower gift. So here are the directions for your gender reveal diaper cake. 1. 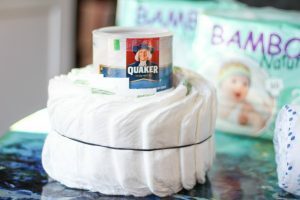 Take the quaker oatmeal container and wrap diapers around it. 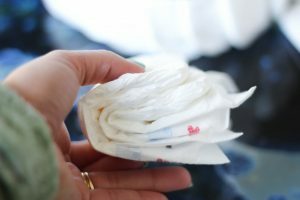 (Wrap the elastic around the container and tuck the diapers under it.) Space them out evenly all the way around. 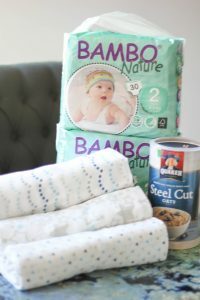 Once completely around pull out the container and replace with the rolled swaddle. 2. Tier two, do the same thing but space them out more so the next tier is smaller. 3. 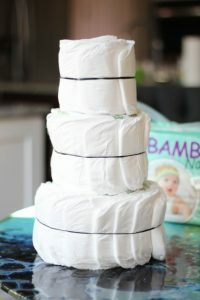 Last tier fold 2 size down diapers (I chose newborn). Wrap an elastic around them. Then space that size diaper around them. Add to the top for the final tier. Add anything you want. If you are giving as a gift, add the gender color or baby shower colors. 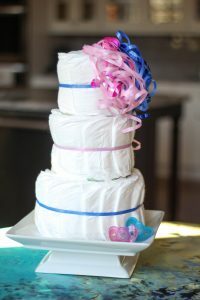 If you are doing a gender reveal then add both colors to the diaper cake like I did here. This is so cute! That would be awesome if pink or blow could explode out of the oat container as the reveal! ? We use those diapers too. ? ?The best. Jacki lol I’m no scientist ?? maybe mini balloons with helium? This is really cute Eryka! This is such a cute idea, love it! So that’s how you make one…I’ve always wondered lol. Cute idea! 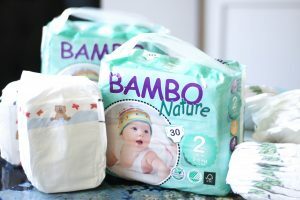 we love bamboo nature diapers! this is such a great idea and super cute too! 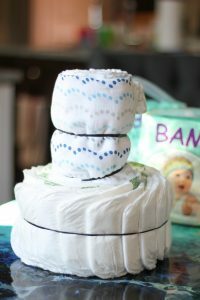 Such a cute idea- I love making Diaper Cakes for showers, but never thought to use them for a gender reveal! Oh this is SO clever!!! I love this for a baby shower gift ? Thanks it was fun to create!